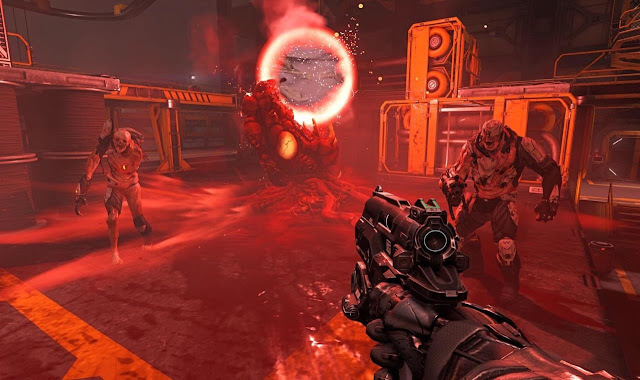 Doom 3 is one of my all time favourite video games of all time, I believe it to be a masterpiece with the level design and plot, as well as the gameplay all combining together to create the feeling that you really are on the doomed Mars UAC (Union Aerospace Corporation) facility surviving a Hell invasion. With Doom Id have gone back to their roots which many people felt Doom 3 strayed too far from, due to this knowledge I didn't have high hopes it would outclass the third game. 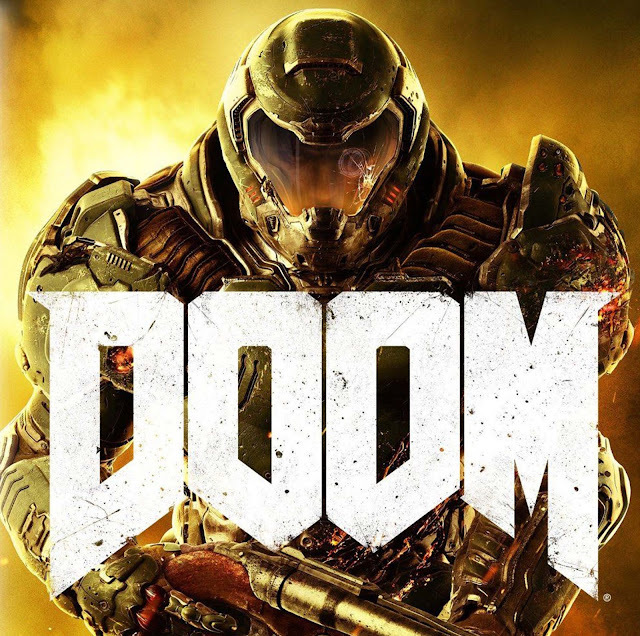 It seems that new Doom doesn't follow on from Doom, Doom II, or Doom 3 (if not for the game taking place at a similar time to the third one I feel it could have easily included that one as canon). You play as a nameless man known as Doom Marine who at the games start is freed from an ancient stone sarcophagus. The UAC had found a gateway to Hell, instead of doing what normal people would do and closing it up they instead decided to explore it and in doing so discovered a cheap and powerful energy source called Argent (as well as the resting place of the Doom Marine). 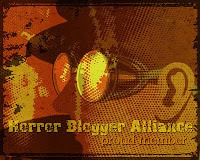 The whole base is occupied with both finding new ways to use the limitless energy, as well as performing experiments on captured demons in hopes of making them into controllable biological weapons. However head researcher Olivia Pierce goes rogue and opens a Hell portal that summons in a demonic army who soon kill all on the base. You have been revived by the base's head of operations; the cyborg Samuel Hayden, who along with a powerful A.I called VEGA help you on your journey to close the portal to Hell, as well as stop Olivia. 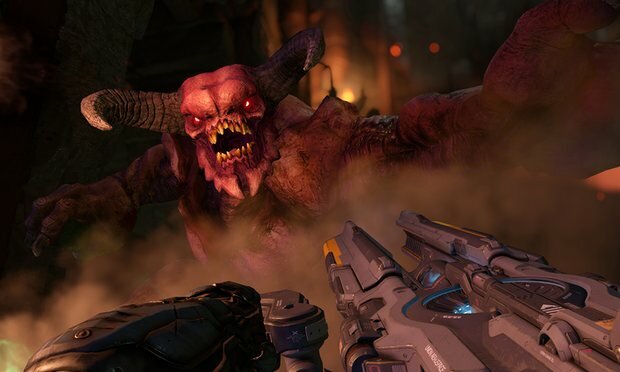 Doom is a mix up of both the old and new style of Doom games, initially it shared far more in common with the previous game than I could have ever hoped, there is plenty of story while the UAC base feels like a proper location rather than a series of random levels (this time around there are levels rather than interconnecting areas, thirteen in all naturally). Most of these levels feature a similar layout, there will be corridors with exploration, then more larger open areas where you will be required to kill all demons before being able to continue on. Levels start off with more of the exploration side than fighting, there are plenty of secret areas to discover as well as power-ups to find, coolest secrets are rooms which unlock original Doom levels. Later into the game once the majority of demon types are shown it turns far more into a original Doom style game with oodles of frantic intense battles, levels design turns far more old school. You have access to all the classic weapons including the plasma rifle, chain gun and fan favourite the almighty powerful BFG. All your main weapons have two different special modes that points can be used to upgrade, the shotgun for instance is either able to fire an explosive round, or fire three rounds at once. The BFG and chainsaw are limited to special slots so can only be used a few times before limited ammo is needed to be able to use them again. When you have dealt enough damage to enemies they get staggered and glow orange, these can then be glory killed in a variety of crazy ways, each enemy type has several different death animations with eyes being burst, throats cut and all sort of limbs being ripped off, these are all uber violent and fun to do only taking a second or two as well as providing you with additional health. You also get abilities in the form of runes that assist you in various ways such as making demons stagger quicker and making your boost jump more controllable. 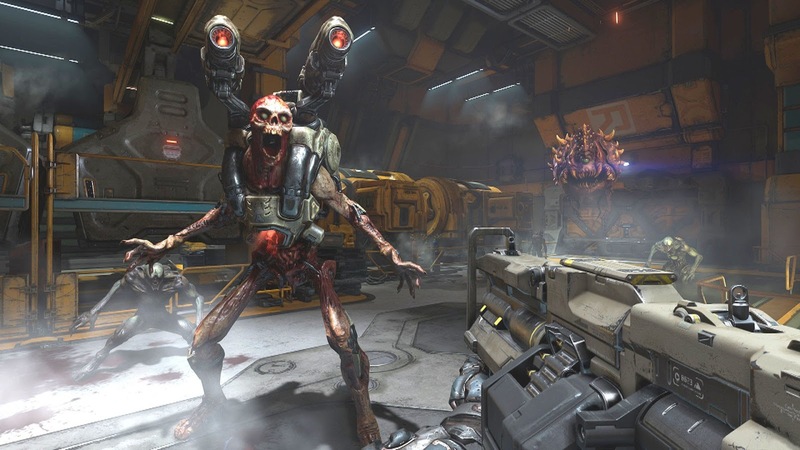 All the classic Doom enemies are here, given updated looks and abilities, you have the zombie grunts who really are no issue at all, imps now clamber around walls and leap about all over the place. The Mancubus, Hell Knights, Cacodemon etc are all what you have known before and pretty much act like you would expect with some fun new twists. There doesn't seem to be any Doom II enemy types but there are a lot of enemies here with not really any copies. Throughout the campaign there are a few boss battles, none of these really gave me any problems but they were a fun change up to the usual gameplay. Graphically this looks great close up, I did notice some of the level backgrounds in the outdoor areas were really quite bland and flat looking, while the mix of industrial areas and rocky ones meant there wasn't a lot of variation. Music is all rock based and while it is very suitable for the carnage unfolding on screen it is not a patch on the original games (something that becomes especially apparent when playing one of the classic maps). The campaign is around ten hours in length on a first playthrough, much shorter I imagine replaying it with souped up weapons and having no need to search for secrets would probably halve that time. The plot is ok, not a patch on three but I did appreciate that there was plot even if fighting through a Mars base post-invasion was not as exciting or engaging as in Doom 3 where you were fighting during the initial invasion. There are echoes that show you a ghostly flashback to the invasion but these are pretty limp looking and underwhelming. The UAC levels are much better designed than the levels set in Hell, I was a bit disappointed in the Hell levels overall, not very inventive in their look, also as a game this is not scary, far too action packed to create any sense of fear at all. In addition to the main campaign there is a cool level editor, I never tried making a level myself (apparently it is quite easy) but there are already hundreds of fan made levels up that I had a load of fun trying out, I expect to revisit this in the future as these levels can only improve, they even feature weaponry not available in the main game. Classic levels once unlocked can be selected from the main screen, these feature the music and level graphics of the original but weirdly you, your weapons, and the enemies are all in the new Doom style, a weird mash up but as I own the original Doom in many versions I did not mind this. Id made much noise about their deathmatch mode, I tried it in Beta and wasn't impressed so didn't even try it in the finished game. From what I hear it is very bland trying to appeal to the Call of Duty crowd and failing quite hard. It is a shame all the DLC planned for this game is only going to be deathmatch levels and no single player content. This game is a healthy does of dumb fun that does at times get a little bit tiring, I loved that the campaign was so long and that it wasn't a complete throwback to the games of old, however it certainly isn't a patch on the one before this (not that I expected it to be). The weapons have real punch to them, the enemies real fun to battle and overall I was pleased with it, even with the level editor though I can tell this unlike three is never going to be up there with my favourite games.